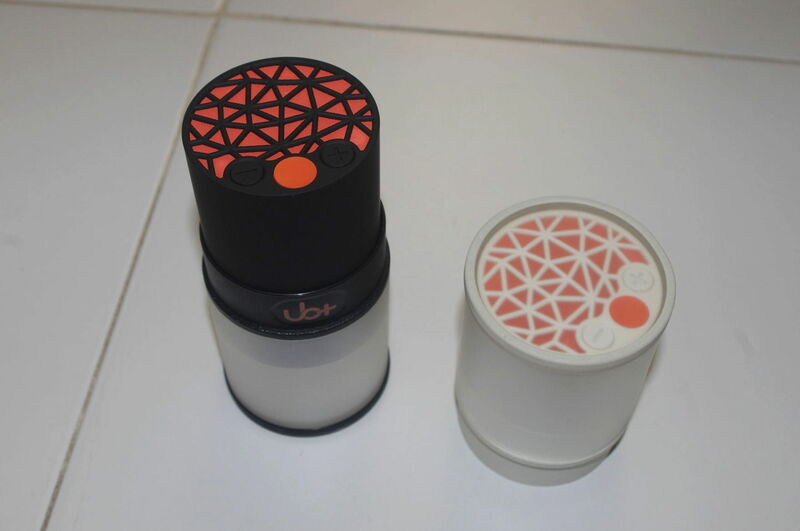 The UB+ Eupho is a portable bluetooth speaker made by a new Singapore company TGI. It promises to be a revolutionary speaker that does not sacrifice audio quality despite its compact size. That piqued my interest and they sent me two of their UB+ Eupho for review. On first listening, I was surprised by how loud it could be. It packed quite an audible punch, offering volumes that belies its tiny stature. The UB+ Eupho is designed with portability in mind. It is cylindrical in shape and rather handy. Comes in two colour options, a whitish grey and classy black. The top grille sports an organic look and otherwise offers clean and simple styling. The material used is rubbery, which is a nice texture for gripping. The UB+ Eupho design was recognized in a couple of local award competitions, such as the Bronze A’ Design Award. For easy portability, the UB+ Eupho is 76mm high, 53mm wide, and weighs in at 120g. In terms of size, it is actually about 30-40% bigger than similar products from XMI or Nakamichi, and slightly heavier (by around 20-30g). Overall, it is still a comfortable size to bring around. There’s an additional accessory casing which doubles up to improve the audio quality. It helps enhance the bass by providing an extra reverberation chamber. When not in use, the expansion casing can be used as a protective case for the Eupho. This additional casing costs $11.90 but for a limited time, will be included with every UB+ Eupho purchase. Controls on the UB+ Eupho are simple, the largest orange button handles on / off / bluetooth pairing. This button is flanked by the volume controls. It is simple and intuitive to use. Looks like a smiley face, don’t you think? Wireless connectivity to the speaker is via bluetooth but it also supports analog 3.5mm connection as well as a digital PC connection through a USB cable. The Eupho comes with a microphone so that you can take calls from your mobile phones even when enjoying music through Eupho, or for a quick conference call accessory when needed. Battery life is also solid, offering up to 20 hours on a single charge, it can be quite the useful companion for short trips. Other similar speakers typically offer 8-10 hours of playback only. As part of the default accessories, there’s a nice carry pouch, micro USB cable, 3.5mm to 3.5mm audio cable. 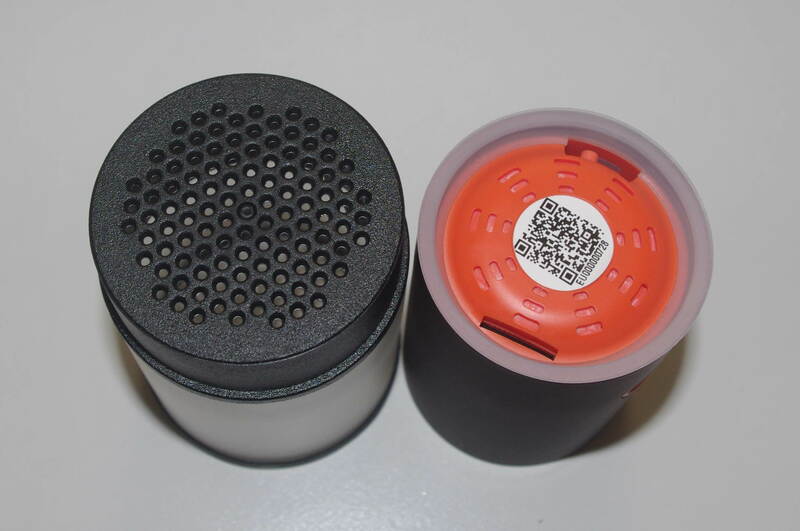 The accessory casing consists of the casing and the plastic amplifier module, which would be inserted to the bottom of the speaker. This serves to open up the speaker port below so that the sound would emit from the bottom of the speaker and reverberate in the bottom casing. The UB+ Eupho uses what it terms ORCHAS technology, which works around conventional speaker compromises of size, weight and sound quality. The UB+ Eupho adopts a unique acoustic structure of the speaker so that the components of the speaker (the driver and a pair of passive radiators) and the pressured air movements vibrate in the same directional axis. TGI says that such an arrangement would allow the orchestrated vibrations to balance each other out perfectly, thereby turning the wasted energy in the form of vibration into reinforced quality sound. To ramp it up a notch, UB+ Eupho allows you to hook up an additional Eupho though the BuddyStereo function. It does help to improve the overall listening experience. Each Eupho can connect up to 2 devices. Once powered on, it will automatically link to your last connected device. 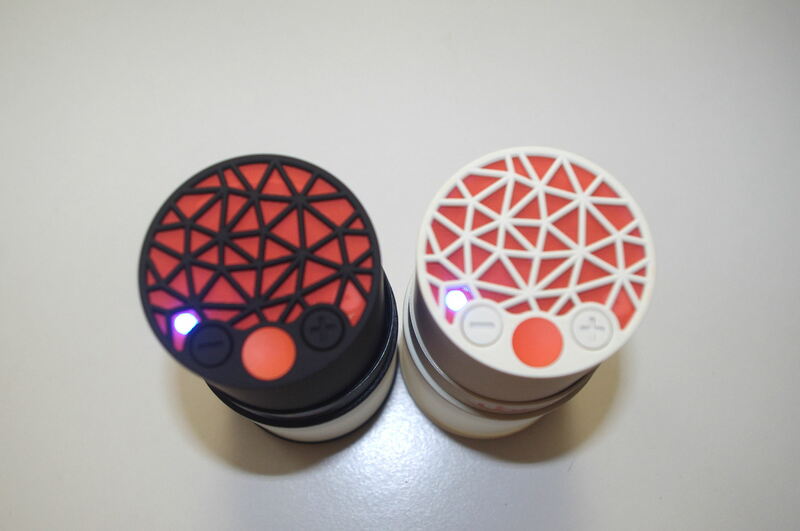 Connect 2 Euphos in BuddyStereo™ mode and you can link up to 4 devices. I tried it with two Android devices and it worked well, convenient so that you can quickly switch between phone, tablet and vice versa. Eupho is designed to be modular. Just like a light bulb to a light fixture, Eupho can integrate sound to anything you want. This is something that TGI shared is in the works – and there will be new speakers of different sizes. Could be something interesting to keep a look out for. The UB+ Eupho supports a frequency range of 60Hz–18kHz (wider than most others in this category), and uses a single 1.5″ driver. It is quite capable of reaching higher volumes as compared to other speakers in this category, notably, the XMI first gen and Nakamichi portable speakers. I was quite surprised at how loud it got, and how stable it retained at high volumes. On its own, the UB+ Eupho delivers overall good sound, but I felt the equalisation to be more biased towards the mids. The lows were also not punchy enough and was a little too muddy. This could be resultant of the casing attachment, but without it, the bass response felt a little underwhelming. The sound also became less rich and less full bodied. However, that could be nit picking too much for a small portable speaker. In head to head testing against the Nakamichi Mini Plus(which won the comparison vs the X-mini of the same generation), I had a hard time picking my favourite, but I would give it to the Eupho. While the Nakamichi had better distinction of the high notes, it loses out to the richer sound from the UB+ Eupho. The UB+ Eupho volume totally blew the Nakamichi away. 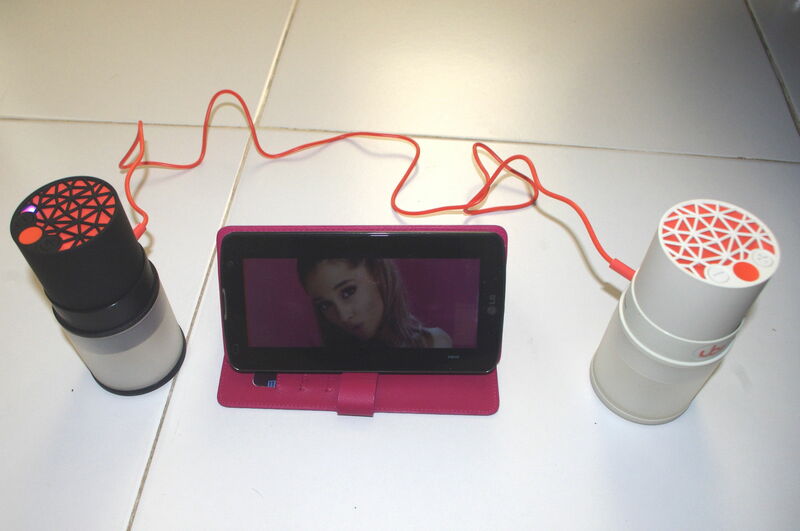 I tested out both speakers from the same phone and swapped back and forth between them on a number of songs. To be fair, the Nakamichi I have is an older model too. If you do have two UB+ Eupho, you can hook them up for stereo and I used them as temporary PC speakers. The added speaker improves the sound stage and stereo listening is always a plus. Not bad. Good listening experience overall, but the bass response is still underwhelming. The UB+ Eupho is now available for S$89.90 from Popular bookstores and TwoBros Lifestyle & Gadget Store. For a limited time, the expansion casing demo-ed above, comes free with the speaker. So after all the music listening over the last couple of weeks, I was impressed by the UB+ Eupho. It was surprisingly loud. Sound quality was good, taking into account that this is still a small size single driver speaker. In addition, the UB+ Eupho is well-designed with useful features such as the up to two device pairing and expansion casing. $89.90 is on the high end for the competitive portable speaker market but you do get a good quality speaker with the UB+ Eupho. It is good to see more local companies offering quality technology products. With their plans for expanded speaker offerings to integrate sound to other accessories, TGI is one to watch.